If you are in Singapore from this month onward, you may be surprised to see the shiny coin in your palm to have the usual obverse image of the Singaporean coat of arms, but a totally different reverse image. Gone is the familiar orchid above the denominated value. If you are visiting the island nation of Singapore recently, see if you could collect this series of coins circulating in the market. They are still in their near mint condition, and still worth as a keepsake (image obtained from MAS Third Series Coins website). Monetary Authority of Singapore (MAS) has launched a new series of coins since end of June (June 26 according to My Paper) this year, the third in fact since their independence. The familiar second series have been in circulation for over 25 years, and they have decided that it is time to produce a new series for the market. In fact, I find this latest series to hold more worth than the denomination on it. 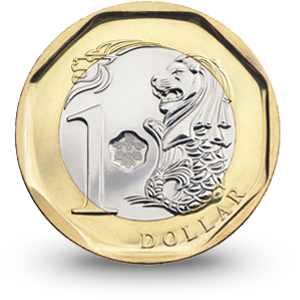 For one, MAS has decided to have a different image for each coin instead of just a common design with different numeral denomination (the first series coins also have different designs on each coin). The other reason is that they chose 5 structures that they believe defines Singapore the best - Esplanade Theater by the Bays, Housing Development Board (HDB) public housings, Changi International Airport, the port of Singapore and Merlion. I guess I like having more defining designs of a country on the coins rather than just a flower on it. The centerpiece of the series would be the $1 coin, a bimetallic coin sporting a silver core framed by a golden ring, which in fact are respectively nickel plated and brass plated steel. The bimetallic coin is so far the first coin in circulation among South-East Asian countries (Thailand has quite a number of commemorative coins that are bimetallic, but they are not meant for circulation). Apart from that, the coin also sported a floral design that is actually a laser mark which will reveal micro pattern of circles under magnification. 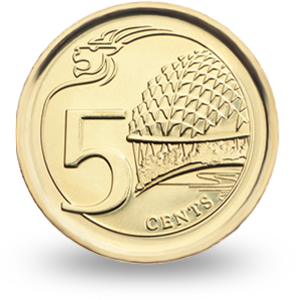 The 5 cents coin sports the famous durian shaped Esplanade Theaters, a structure which housed most of the art performances (image obtained from MAS Third Series Coins website). 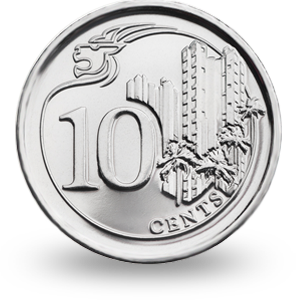 The 10 cents coin shows blocks of public housings. The HDB housing blocks are undoubtedly one of the unavoidable scenes when visiting Singapore, and while most Singaporean voiced their criticism of their government in handling the crisis of housing prices and availability, it is still noteworthy that when comparing the island republic with their sister city state, Hong Kong, the former did superbly well in maintaining a clean environment around the housing areas. The Singaporeans are to be commended as well for keeping their environment clean, be it out of habit or out of fear (for being caught) (image obtained from MAS Third Series Coins website). 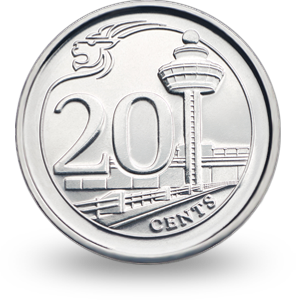 The world's best airport as voted in recent years decorated the 20 cents coin. Changi International Airport is one of Singapore's proudest achievement, and for very good reason. Any frequent traveler would be excited with the engaging decorations and equipment in the airport. Transits could never be so exciting (image obtained from MAS Third Series Coins website). 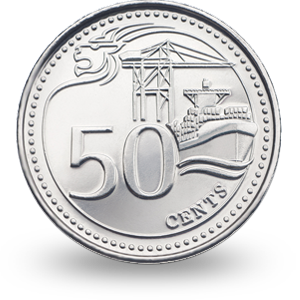 The port of Singapore which decorated the 50 cents coin would appear unremarkable to most, foreign visitors and citizens alike. Browse through the history of the formation of Singapore before its current independence, and one would find that it once was, and still is, one of the most important stations along the route connecting the east and the west (image obtained from MAS Third Series Coins website). What better way to showcase a bimetallic $1 coin than a Merlion? The Singapore Merlion never did exist in any Singaporean myth, nor was it remotely related to its naming (Singapore was originally Temasek pre-colonial). It was in fact designed by Alec Fraser-Brunner for the Singaporean Tourism Board (STB). Nevertheless, one of the most photographed icons in Singapore is undoubtedly this marble white structure sprouting water through its maw (image obtained from MAS Third Series Coins website). Comparing the obverse of both the second and third series will reveal a subtle difference: the coat of arms are slightly different, with the beasts of guardian spaced further apart. This may not be very obvious unless one compares both series of the coin side by side. If you are visiting the island republic in recent months, keep an eye for the shinier coins, for you may be holding the latest circulating coins from the third series. On the other hand, the second series may not be seen a few years from now, so it may still be worth it to collect both series and keep them as mementos of the history of this country.